The RI Department of Behavioral Healthcare, Developmental Disabilities and Hospitals (BHDDH) is committed to building and strengthening the prevention workforce in Rhode Island by supporting training and professional development opportunities and facilitating the certification process for both beginning and experienced prevention professionals. 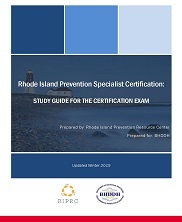 Toward that end, BHDDH commissioned the development of this Study Guide for individuals seeking to take the Prevention Specialist Certification Exam offered by the Rhode Island Certification Board. JSI, 2016.